August 01, 2018, 9:13 a.m.
As strikes, flight cancellations and news of potential job losses blight the budget airline Ryanair, YouGov BrandIndex data indicates how perception of the brand is taking a hit. 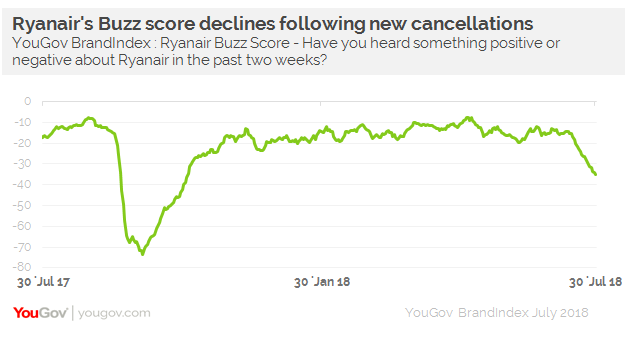 YouGov brand tracking data shows that Ryanair’s Buzz score (whether someone has heard something about a brand, and if so, if it was positive or negative) has declined sharply over the last few days. 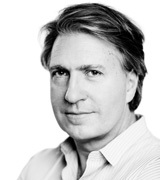 Its score has moved from -13 to -35 since news of cancellations emerged. This score has not bottomed out yet, so we may expect it to decline further still, as Ryanair’s struggles linger. That being said, the score has a long way to go to match the low that Ryanair experienced in late September/early October 2017, during which time its rating plummeted to -70. The knock-on effect of negative headlines in this case is that Ryanair’s Impression score has also suffered. On this metric, Ryanair’s rating has already dropped from -35 to -48. This score places the brand at the bottom of the airline sector on this metric by a significant amount. Again though, this is someway short of the low of -62 that the brand’s Impression fell to in autumn 2017. Despite this, the good news for Ryanair is that so far the negative news has not had a huge impact on whether potential customers would consider travelling with the airline. Its Purchase Consideration score has remained around the 22% mark. While this score is consistent with its rating from the last few months, it is not as high as the 25% that said they’d consider flying with Ryanair pre-2017 crisis. Perhaps this suggests that while cancellations and rescheduled flights are infuriating for those impacted, for a large part of the public Ryanair remains an option due to its core offering which is, essentially, cheap prices. That being said, the longer negative news lasts, and the more people that have their holidays compromised, the harder it will be for Ryanair to regain positive momentum, and the more people may be put off travelling with the brand.